Finals at Lucas Oil Stadium in Indianapolis. With the roots of military music in the U.S. dating back to the battlefields of the American Revolution, later continuing the tradition as parade units returning from WWI, the drum corps activity has long shared a special connection to the armed forces of our country. Today some of the nation's finest musicians—including a significant number of former drum corps members—fill the ranks of American military music ensembles across the country and around the world. 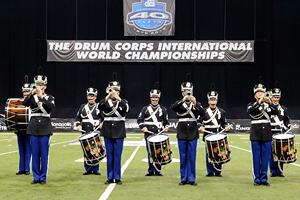 Drum Corps International experienced the honor and privilege of hosting the West Point Band's Hellcats of the United States Military Academy when they performed in conjunction with the 2012 DCI World Championships in Indianapolis. The unit, which dates back more than 220 years to the time of George Washington's Continental Army, is made up of buglers and rudimental drummers who perform with period-inspired instruments at a variety of parades and ceremonies on behalf of the U.S. Military Academy throughout the year. The following video is of the Hellcats' performance that kicked off the DCI World Championship Finals this past August. As Veterans Day approaches on Sunday, Nov. 11, many thanks go out to all of America's heroes. We thank you for your service! View more videos from the DCI World Championships on the DCI Fan Network YouTube channel.